You are here: Home � All Deals , Beauty: Health Watches Jewelry , Featured � Buy a Telebrands Deluxe Home Pedicure Set for $9.99 shipped. Buy a Telebrands Deluxe Home Pedicure Set for $9.99 shipped. 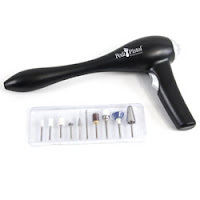 Buy.com is offering a great deal on a Telebrands 3583 Pedi Pistol Deluxe Home Pedicure Set - now only $9.99 shipped to your door. This set is going for less then then an average pedicure itself. It comes with 10 different precision-created heads such as a shaping cone, an emery barrel, a flat disk, and emery board, a satin brush, a foot cone, a ball tip, and more. All these attachments will help you remove calluses, trim your nails, fix and shape cuticles, file, smooth, apply cream, and polish your nails. Lastly the device itself reaches your toe nails and heels without the need for you to bend over.